While I was born and raised in the far upper reaches of Michigan with Lake Superior as my childhood water playground, both my father and mother's family history stretches back to the founding of this country and the colony of Massachusetts. My father's family were woodsman, soldiers and farmers in the western part of the colony but my mother's family were seafarers, merchants and shipbuilders who made their homes from the Rhode Island coast all the way up to Bath, Maine. My mother's mother was born to an old whaling family and raised in New Bedford, MA. Summer often found my brother and I "out east" for a few weeks to spend time with the cousins swimming off the dock in the Atlantic, or looking back at the century old captain's house from the deck of a sailboat. My great aunt, who recently passed away, lived in that house until the ripe old age of 102. Now, a seventh generation of my family has taken up residence in the house and even though the dock and boathouse are long gone, swept to sea in the "no name" storm of 2000, the young cousins still gather during the summer to learn how to sail in the bay and clam in the sand when the tide is out. When my great aunt could no longer cook and bake, she gave me copies of her cherished family recipes, including her recipe for Anadama bread. Growing up, I loved helping her make this dark, dense molasses sweetened bread. She would make it before going to bed and let it have a long, slow rise over night. 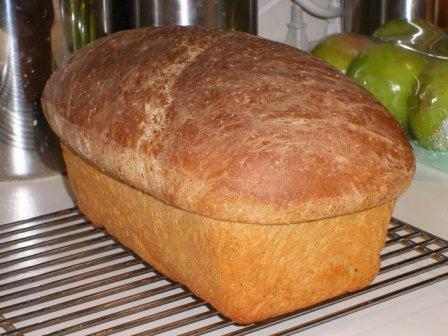 I would awaken each morning to the smell of Anadama bread baking. To this day, I don't think there is a bread I enjoy more toasted than Anadama bread. Just biting into it, still warm from the oven, transports me back to the kitchen in New Bedford with the gray zinc sink and the smell of the ocean drifting into the kitchen through the open windows. While I was browsing through the Yellow Farmhouse Cookbook looking for the recipes that would make up this week's menu for the Cookbook Casting Call, I was hoping to find a recipe for Anadama Bread. So, I was delighted to not only find a recipe that bore striking resemblance to my great aunt's, methods that had been tested to death by those good folks at Cook's Illustrated but also one of the many versions of the story behind how Anadama bread got its unusual name. Depending on the teller, the story of how the bread came into existence and got its name is about either a woodsman, a hunter, a farmer, or a fisherman from old New England whose wife, Anna, was an absolutely horrid cook who could only make cornmeal mush. One evening, coming in from the woods/fields/water, the man came home to find yet again a bowl of cornmeal mush waiting for him. The man angerily grabbing the dish, he fixes himself some dough from molasses, flour, and yeast and while the bread bakes, he sat by the fire muttering to himself over and over, "Anna, damn her. Anna, damn her." On Monday, while the snow storm raged outside, I woke with cravings for good stick to your ribs New England fare. After putting a pot of navy bean soup and country ham on the stove to simmer all day, I made the version of Anadama Bread in The Yellow Farmhouse Cookbook. It rose beautifully and baked into one of those country fair perfect loaves. The biggest difference between the recipe of my great aunt and Christopher Kimball's is that his calls to cook the cornmeal into cornmeal mush, while my great aunt's just has you pour boiling water over the cornmeal and let it sit until luke warm and then stir it into the yeast and milk. While I really enjoyed the taste of the Anadama Bread from The Yellow Farmhouse Cookbook and it did rise much higher than my great aunt's does when I make it, I missed the texture the soaked cornmeal provides. The cornmush completely disappeared in the bread, leaving behind only the taste. I think the next time I make Anadama bread, I'm going to use the ratios of flour, molasses, yeast and liquid in the recipe from The Yellow Farmhouse Cookbook and use my great aunt's method with the cornmeal. That way, maybe I'll get the best of both worlds: the height and crumb of the Yellow Farmhouse and the texture of my family's version. I'm submitting this bread to Susan at Wild Yeast's Yeastspotting. In a medium bowl, pour boiling water over corn meal and set it aside for about 15 minutes or until water is almost absorbed. In small glass bowl, dissolve yeast, milk, and pinch of sugar, set aside for five - ten minutes until frothy. In large bowl, combine yeast mixture, molasses, and 1/4 room temp water until molasses is completely mixed with yeast mixture. Add cornmeal and any residual water. Mix in salt and then combine three cups of the flour. You should have a very moist, almost batter like mixture. Add in remaining flour 1/4 cup at a time until dough is sticky, firm but elastic. Depending on your flour, you may need a little more or a little less flour to get the dough to this stage. Knead dough for about five - seven minutes adding small palm full of flour if dough clumps to your hands. Let dough rest five minutes. Give dough four to six quick kneads and then let rise in a greased and covered bowl until doubled. Tip dough onto lightly greased counter and form loaf. Place dough into greased 9" x 5" loaf pan, loosely cover and let rise until dough is almost 1" above edge of pan. Pre-heat oven to 350 degrees. 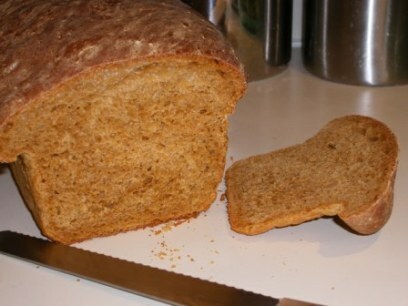 Bake bread 30 - 40 minutes or until bread sounds "hollow" when tapped. Allow to cool for about twenty minutes before slicing.